Estroven Maximum Strength + Energy is a dietary supplement formulated to deliver dramatic relief to the different symptoms related to menopause. It is a stronger version of the regular Estroven formula designed to provide maximum relief for those who are suffering from severe menopause symptoms. The product contains a combination of natural extracts like soy isoflavones and black cohosh for considerable relief of the discomforts associated with menopause. It is being sold by several retailers like GNC and Walgreens. One box container with 28 capsules is priced $21.49 but the price varies a little from one seller to another. What Estroven Maximum Strength Claims? Who is Behind the Estroven Maximum Strength? The product is under the Estroven brand which specializes in dietary supplements for menopause relief. Estroven is under the company i-Health, Inc. which was born from the integration of Amerifit Brands and i-Nutrition. This partnership combines science and ingredients with expertise in marketing for a world-class company. Estroven has been around for a long time and it is one of the most recognized brands in dietary supplements for menopause relief. Estroven Maximum Strength Review – How Does It Work? Estroven Maximum Strength + Energycombines soy isoflavones and herbal extracts which have been shown to relieve the different symptoms of menopause. Soy isoflavones helps address the primary cause of menopause symptoms which is the declining level of hormones in the body. 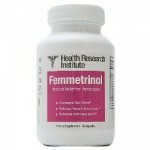 The formulation also contains black cohosh which is well-known as a natural relief for menopause symptoms. It has been shown to be effective in relieving hot flashes and night sweats which are the most problematic among all the discomforts associated with menopause. The formulation also contains other natural extracts that relieve specific menopause symptoms such as sleeplessness and irritability. 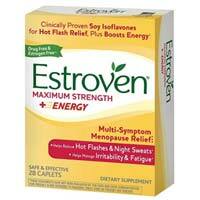 What are the Ingredients in Estroven Maximum Strength? Black Cohosh – This is one of the oldest remedies for hot flashes and other menopause symptoms. 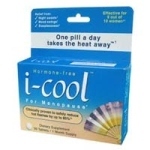 Recent studies have proven that it is effective in relieving hot flashes by up to 49% in a few weeks of use. However, some studies indicate that it can cause side effects on certain women. Soy Isoflavones – This has been shown to have a positive effect on female hormones thereby helping address the main cause of menopause symptoms which is the declining levels of certain hormones. 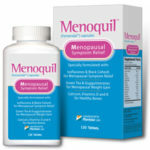 It is also one of the most popular natural remedies for symptoms associated with menopause. Magnolia Bark – It specifically addresses irritability which is also one of the most common menopause symptoms. Green Tea and Yerba Mate – This combination is said to help manage fatigue which is a common problem during menopause. Green tea helps increase energy level while at the same time offering the benefits of antioxidants. Yerba mate is also an energy booster and it helps improve bone mineral density which is beneficial for menopausal women. Take 1 capsule of Estroven Maximum Strength + Energy a day near one meal (same time each day). For optimal results, it should be used at least 60 consecutive days. Like any dietary supplement, inform your health care provider before taking this product. There is a certain amount of risk in buying Estroven Maximum Strength + Energy since there is no free trial offer or money back guarantee. However, the formulation is impressive and there are many feedbacks from women who have tried it saying it is really effective in relieving menopause symptoms. There are also many loyal users who continue to use the supplement for menopause relief after they have gone through menopause. All in all, this is a product worth trying but it is not really suitable for everyone since some users have experienced adverse reactions from taking it.